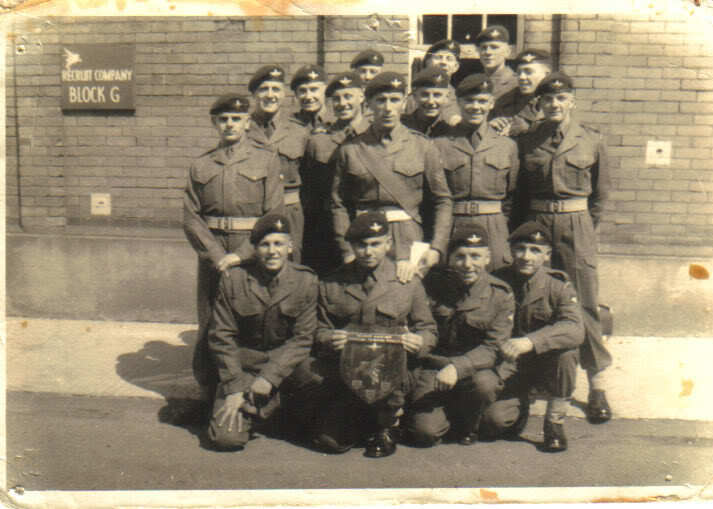 Second row: Tom Hayes, Algie Hilton, Alan Winfield, Bob Giggs, Sgt Herbert, ?, Taff Ivey (Deceased), ? all others do not know but the tall lad at the back is Jock Delgarno. Not bad for an oldy!!! I first met Tom Hayes when he was one of our Pl Corporals in Depot (273 Pl) along with Tommy Morrison and Griff Williams as Pl Sgt. Not so many years ago Smudge Smith (another from 273) bumped into Tom Hayes when Tom worked on Security at Fort Dunlop Birmingham. Great guy and a good instructor. Who are all these young guys in 141, and what happened to them? They became like the rest of us! Anyone know what the shield was for? Wrockwardine Wanderer wrote: Anyone know what the shield was for? The Sheild is interesting I do not know if Doug remembers but the reason Dutch Holland is holding with his hands at the top is because someone dropped it and the plaque on the top came off on one side and was hanging down, so he had to hold it in postion I believe that Dutch who went to 2 Para had rather a dodgy spell there I cannot seem to get to the bottom of it!! Can,t remeber the accident,Dutch was champion recruit of 141,and yes he did go to 2 para and quicky rose to cpl. However whithout going to detail,he was a naughty cpl,and soon left the regt.He came from southampton . Had a visit from Jason Hazard, here for a visit from \New Zealand. Why do members start conversations in thr Guest Book and not use the Forum? Hope you had a good visit with jason,The main reason we start on the guest book is to draw attention to the forum.not everbody has logged into the forum.so it is a way of drawing attention to it,and if you are not a member,you can,t access the workings of the forum.Hope you are okay.bill fagg and bob giggs are looking to pay me a visit in july.I hope to post some more photo,s soon,i,ve got to find out how the TESCO,s machine works.perhaps you have some of 142.Jonny(squeak) holborn,Joe lylle, paddy smith,even dear old Ron (zoom) Spenser. Will have to dig around, the names you gave are all familiar. I,ve accidentlly remove the photo. i,ll put it back when I find out how A couple of more names are.Cowboy Johnson,Tom Parker,the half hidden face?? and the guy on the right escapes me. jock Dalgarno,s career was short live as he had rather a bad parachuting accident,and was invalided out.The pl corporals were Hinchcliffe, and Milne.The chap on the right of Sgt Herbert is Sandy Bennett,Sandy died rescently,His ashes are to be dispersed into the Helford passage on Saturday.At the TREBA Military day,sponsored by the Royal Cornwall PRA,in aid ofPara Regt Charities.